"This recipe is so quick and easy. My whole family loves it, especially the kids. It is great served with crusty French bread." In a large pot over high heat, combine the water, potatoes, bouillon, celery and onion. Bring to a boil and cook until soft. Reduce heat to low and use a masher to mash down the potato mixture in the pot to desired consistency. Add the soup and lightly whisk, until smooth. Add the cheese a little at a time, stirring often, until melted. Didn't really care for this at our house. It taste more like potato soup than cheese soup and I won't make again. This truly is the best soup ive ever tasted! My whole family loves it. Tastes great with pieces of tortilla chips and shredded cheese on top of the soup! --thank you!!! laura, So. Ca. very good a little thin but thats o.k. my family loves crackers with soup.i did add 4oz extra cheese will make again. This was fairly quick and very easy! 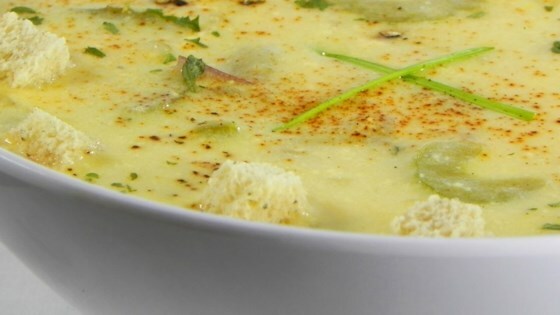 It reminds me of the cheese soup at one my favorite restaurants. Wonderful on a cold night! Very easy to make and delicious. My 11 year old picky eater loved it. I added cooked cubed potatoes at the end to make it a more hearty soup.